5 awards of a $100 gift certificate from Quest Bars. This is the biggest prize package yet in the Nourished giveaway, with a total value of a whopping $500! Each of five winners will receive a $100 gift certificate to spend on one of the most popular products to hit the market in recent memory. Since this is the grand finale of my first ever contest, I’m going to extend the time to enter to 2 weeks rather than one. Quest Bars: If you want to know what works for losing fat and gaining muscle. ask a body builder. Quest Bars are used by bodybuilders and fitness competitors, even when preparing for contests, allowing them to trim fat and build muscle while eating something they enjoy. And you don’t have to be young and athletic to appreciate these great tasting treats. Quest Bars are not just thinly disguised candy, like many nutrition bars. They lay claim to the best nutritional profile of any protein bar out there. They have 20 grams of protein, all of it from nuts. They contain no maltitol, glycerin, trans fat, gluten, or soy, and they have just a few ingredients. One bar has from 2 to 6 net grams of carbohydrates, depending on the flavor, and there are LOTS of flavors (11 at last count!) to choose from, Chocolate Brownie, Strawberry Cheesecake, Lemon Pie, and Coconut Cashew to name a few. The original line is sweetened with lo han guo and sucralose and the new “all natural” line with stevia and erythritol. 1. Take a Quest Apple Pie bar, unwrap it and put it on a cookie sheet. 2. Switch on the broiler in your oven. 3. Place the Apple Pie bar directly under the flame, only a few inches below the flame if possible. 2. Wait about 4 minutes for the top to turn golden brown. 3. Flip it over and wait, about another minute or two (2nd side browns faster, because it’s already warm) until it too is golden brown. 4. Remove from oven and eat while it’s still warm. 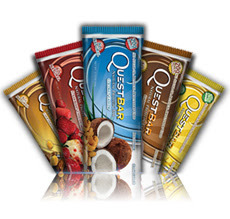 You can order Quest Bars by the box or one bar at a time from the website at www.questproteinbar.com or by phone at 1-888-212-0601. They also offer a subscription service for automatic delivery with a 10% discount. 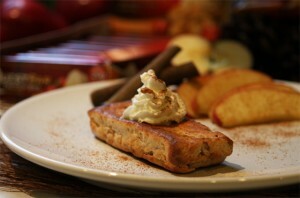 Contest, healthful apple pie, Quest bars. Bookmark. I'm always looking for great new low carb treats!!! Please add my name to the hat, I'd LOVE to win this one!! Oh yum–Quest Bars are awesome. These bars sound so good! I would love to enter. I'd like to win this! Oh, this is one I REALLY want to win! Please enter me in the contest. Judy, please enter me in the drawing. BTW I am going to be ordering a copy of you book for my doc. He's become more interested in LC WOL. Good news about the doctor! More and more of them are "getting" it. I will need your e-mail address so I can reach you if you win. You can send it to judy@carbwarscookbook.com. "They have 20 grams of protein, all of it from nuts"
These bars get their protein from whey.